Touch Magic™ is a new product line from LeapFrog that brings intuitive touch technology to preschool toys for the first time. It combines fun, learning, and creativity. Touch Magic learning toys utilize capacitive touch technology that recognizes every tap, touch, and swipe to bring each product to life. This new collection of interactive toys includes four products that help develop core learning skills, and encourage exploration and discovery. 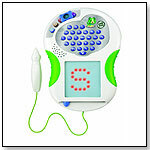 The Touch Magic Rockin’ Guitar brings musical fun and develops preschool skills with every little touch. It fits kids’ development, engages their creativity, and builds their confidence as they learn ABCs and many new words through educational songs. Kids can choose to play solo without a backup, play along with a band, or select an electric or acoustic guitar to accompany songs including Rockin’ Robin, Itsy Bitsy Spider, If You’re Happy and You Know It, and Pop Goes the Weasel. TDmonthly recommends looking at Schoenhut for similar, high-quality musical toys and instruments. Little touches. Big learning. All aboard for nonstop number fun and early vocabulary with farm friends. Touch numbers 1-20 to hear their names and count along. Fun games reinforce the learning. Sing along to fun songs and build your own version of "Old MacDonald" with 10 friendly farm characters. Explore 20 vocabulary words for food and animals and get practice associating a set of objects with a number. Parents can connect to the online LeapFrog Learning Path for customized learning insights and ideas to expand the learning. LeapPad2 Explorer™ inspires kids to imagine and explore with front-and-back cameras, 4 GB of memory and a library of 325+ cartridges and apps for limitless learning and fun! 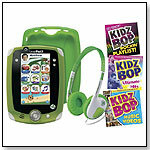 This special KIDZ BOP Music Pack features: a LeapPad2 Explorer™ tablet, Target Exclusive KIDZ BOP Rockin' Playlist, KIDZ BOP Ultimate Hits Playlist, KIDZ BOP Music Video Collection, a pair of kid-friendly headphones, a protective Green Gel Skin and 5 included apps: Pet Pad writing app, LeapFrog Learning Songs, Art Studio, Cartoon Director and one app of your choice. (Some included apps require Internet connection to download.) 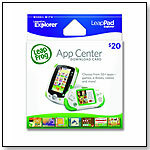 Works with LeapFrog Explorer cartridges and apps (sold separately). The #1 learning tablet just got better! LeapPad2 Explorer™ inspires kids to imagine and explore with front-and-back cameras, 4 GB of memory and a library of 325+ apps for limitless learning and fun. Comes bundled with Explorer Learning Game Cartridges: Disney Jake and the Never Land Pirates and Disney•Pixar Pixar Pals and a green LeapPad case. Also comes in pink. Light the way to early writing with Scribble & Write Children trace the lights to get practice drawing simple shapes and pictures, then graduate to learning upper- and lowercase letters with step-by-step guidance. Fun learning games help reinforce letter knowledge. — As of 12/13/2011 this product had 4.3 out of 5 stars from 212 reviews on Amazon.com. 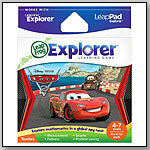 This download card provides an access code to download learning games, e-Books, videos and more to Leapster Explorer or LeapPad Explorer systems. — As of 11/14/2011 this product had 4.2 out of 5 stars from 9 reviews on Amazon.com. Pros: Nice gift idea; Lots of games available. Cons: Lots of packaging, but all it is, is a card with an access code on it. Kids can use this stylish case to hold their LeapPad Explorer and 6 game cartridges (fits cartridges for LeapPad Explorer and Leapster Explorer systems). Launch date: 2011. Though sleek and thin, the LeapPad can withstand kids' roughhousing and dirty fingers. Designed to be flipped, shaken, and turned by little hands, the LeapPad comes with a tilt sensor for game control that puts kids in the middle of the action. A 5-inch color touch screen makes it easy for kids of all ages to learn and interact. There are more than 100 learning games, videos, books, and apps available, and topics covered include spelling, phonics skills, mathematics, science, music, geography, and more. — As of 8/29/2011 this product had 4 out of 5 stars from 96 reviews on Amazon.com. Pros: Larger screen than other LeapFrog products; works with Leapster explorer games and apps; comes with extra stylus in case one gets lost. Cons: Screen and camera resolution are low; takes 4 batteries; processing is slow; most apps need to be purchased separately. This game features the Cars 2 characters in a global spy race. Teaches measurement, graphs, patterns and problem solving. In different challenges, kids must measure the correct distance to make a fantastic jump; complete patterns to find clues or escape traps; and race as Lightning McQueen and see who's the fastest car. Appropriate for children ages 4 to 7 years (grades pre-K to 1). Only for Leapster Explorer. This product uses music and rhythm to teach key lessons. It features 15 musical activities and more than 40 songs and melodies. 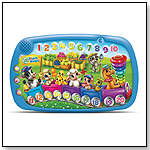 It introduces letters A–Z, numbers 1–10, colors, shapes, first words, cause and effect, and instrument sounds. Lessons are in both English and Spanish. — As of 1.06.2011 this product had 4.5 out of 5 stars from 51 reviews on Amazon.com and was No. 15 on the top 100 bestselling toys and games. Pros: Colorful experiments intrigue young children. Cons: Adult supervision required at all times; too simple for older children. As of 1.06.2011 this product had 4.5 out of 5 stars from 637 reviews on Amazon.com and was No. 22 on the top 100 bestselling toys and games. Pros: A variety of activities; Helps develop fine motor skills. Cons: The legs are not easily detachable. Here is a fun way to learn the names of the states, the capitals, products and a smattering of history. This two sides map is an "add-on" to be used with the electronic Tag reading system. 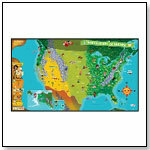 You need the sensor stylus to explore, answer questions, and play games on the big 35" X 20" map. Along with the kinds of info and quizzes you would expect, they have also added distances and travel times between places, animals, cardinal directions and other map reading skills. Awards: Oppenheim Toy Portfolio Best Toy Award, Platinum, 2010. This is a talking pot that speaks when you put its lid on and off. Sometimes it says "on" or "off" or switches to "closed" or "open." Toss the toy veggies into the pot and use the big grey spoon and it adds stirring and mixing sounds along with little factoids about the foods. With the LeapFrog Chat & Count Phone, children can sing along to songs about counting and phone routines, explore more than 15 phone activities and call on Scout for learning fun as they trade calls and voicemails. Parents can connect to the online LeapFrog Learning Path for customized learning insights and ideas to expand the learning. — As of 8.16.10, this product had 4 out of 5 stars from 9 reviews on ToysRUs.com and was listed No. 33 in best-selling toys and games. PROS: Interactive, educational, engaging. CONS: Some parents felt the product features too few activities. As Andy prepares to depart for college, Buzz, Woody and the rest of the loyal toys are troubled about their uncertain future. This comical adventure lands the toys in a room full of untamed tots who can't wait to get their sticky little fingers on these "new" toys. It's pandemonium as they try to stay together to ensure that "no toy gets left behind." The game features expanded play for the Leapster2 system, so Leapster2 players can connect online for extra games, activities and rewards, and parents can get detailed learning progress reports through the online LeapFrog Learning Path. — As of 7.26.2010, this product had 5 out of 5 stars from 1 review on Amazon.com, and was listed No. 1 in the top 100 best-selling toys and games. PROS: Multiple games to choose from. CONS: Not perceived as challenging enough by some children. This portable learning device offers a high- resolution touchscreen, click-in camera accessory and Flash and 3-D graphics. 40 different play experiences are available, including 12 cartridge games and 18 Leaplet Learning Applications. Awards: 2010 Oppenheim Toy Portfolio Best Toy Award, Platinum. The Alphabet Pal can giggle, sing, walk and flash its antennae. 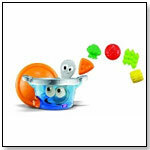 Four learning modes are designed to introduce letter names, letter sounds, colors and music. Preschoolers can practice drawing and writing by tracing the lights that make shapes and letters. This portable tool is designed to foster development of phonics and early writing skills, as well as gaining control of a pencil. 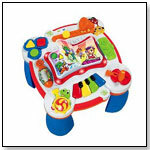 It employs a retraceable surface, and parents can find more ideas for learning online at the LeapFrog Learning Path. — As of 7.26.2010, this product had 4.5 out of 5 stars from - reviews on Amazon.com, and was listed No. 20 in the top 100 best-selling toys and games. PROS: Educational but entertaining; children seemed to enjoy learning to write with this product. CONS: Some customers felt the product did not provide enough constructive feedback. 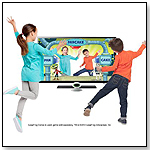 This TV-based gaming system for preschoolers combines full-body movement, music, education and fun. Combining LeapFrog’s learning products expertise with Disney’s storytelling heritage and preschool TV programs, the system lets kids bring the fun of Playhouse Disney to life at their house. As they groove and play, kids can gain a greater understanding of core preschool skills such as math, language and music. The Zippity system leads kids through eight lively learning games that use an interactive mat for lower-body movement, such as running, dancing, jumping and marching, and a tummy-high joystick, or “bopper,” for upper-body action, such as moving left, right, forward and back. The easy-to-use system with eight learning activities pre-loaded—comes with a foldable mat and bopper, which interacts wirelessly with the Zippity console. Launch date: August 2009. Turn My Pal Scout into a true best friend by personalizing the learning online. With 14 fun activities built-in and more than 30 melodies to choose from, this snuggly custom pal is a lasting learning companion. WIth a USB cord, you can program Scout to say a child's name and refer to his or her favorite foods or colors. Launch date: 2009. — LeapFrog informed TDmonthly in June 2009 that My Pal Scout was recalled due to potential removal of its paw decals. A redesigned My Pal Scout, available August 2009, replaces the decals with embroidered paws. Little learners play in a grown-up way with Text and Learn. The pretend browser and play text messages with Scout the dog lead to real-life skills as children explore letters and QWERTY keyboarding in fun on-the-go games. Launch date: 2009. The Tag Junior system comes with a LeapFrog-original board book called If I Were, which explores animal sounds. Each of the other eight sturdy board books in the Tag Junior library focuses on a different preschool theme, including sounds, colors, letters of the alphabet, numbers and social play. Curious George, Dora the Explorer and Winnie the Pooh are just a few of the childhood favorites featured in the Tag Junior library. Launch date: January 26, 2009. The unit functions as a database of virtual flash cards, displayed on a 2-1/2 screen. 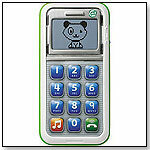 One GB of information can be stored on the unit’s built-in flash memory drive. The system also features music-playback, language translation and software download capability. Launch date: Fall 2008. The electronic reading pen contains a small infrared camera that recognizes letters, words and symbols printed on the pages of Tag books. The pen delivers audio, games and activities that correspond with the specific book the child is reading. Tag's 16MB memory capacity allows it to hold up to five books at any given time. Tag also tells parents which words kids are reading well, and documents the amount of time kids spend reading. — As of 8.03.2010, this product had 4 out of 5 stars from 43 reviews on Amazon.com and was No. 50 in the top 100 best-selling toys and games. PROS: Educational, entertaining and portable. CONS: Requires a computer with USB port and CD device. Is not compatible with some MAC computer systems. The handheld system provides children with fun activities and rewards that encourage continued play while allowing parents to see what their child is learning and share in their accomplishments. The system features auto-levels that adjust games to fit each child’s particular skills and progress, so children are appropriately challenged. — As of 1.06.2011 this product had 4.5 out of 5 stars from 51 reviews on Amazon.com and was No. 17 on the top 100 bestselling toys and games. Pros:Very soft; appeals to girls of all ages. Good quality and multi-purpose. Cons: Difficult to wash and gets dirty easily.